For the last two years Gaia's Spa Director Diane Nettleton has been travelling the globe in search of inspiration. So far her quest has led her to China, Indonesia and Portugal and Australia. 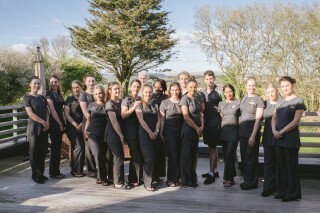 However, our passion for uncovering the finest ingredients and global techniques reaches far beyond Gaia Spa's treatment menu and product range - we take the same diligent approach to selecting the world-class team for our flagship spa at Boringdon Hall on the edge of majestic Dartmoor. We are a family owned, forward thinking company comprising of The Fistral Beach Hotel and Spa, The Esplanade Hotel and Boringdon Hall Hotel, we recognise that our team members are as different as our hotels and value the creativity and personality that you can bring to your role. Each employee plays a part in delivering the guest experience which is why we believe it is important to invest in our employees and offer excellent training and development opportunities. If you’re ambitious and would like to see yourself climbing the ladder within a company that recognises people as their greatest asset, we want to hear from you!